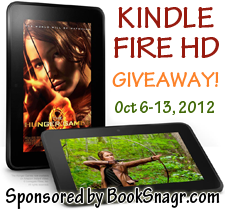 FREE blogger sign ups are now open for the Kindle Fire HD Giveaway Event! This group giveaway event is hosted by Daily Mothering and sponsored by BookSnagr.com, a great website for book lovers that helps connect you with free, discounted and recommended eBooks! The event will run from October 6-13, 2012, and we are hoping to get about 200 blogs together to promote this event. With incredible exposure over a broad range of blogs, this event will be a fantastic way to increase your Facebook, Twitter or Pinterest followers by leaps and bounds! We will be giving away one of the BRAND NEW and just-released Kindle Fire HD Tablets (RV $199) to one lucky winner! This event is sure to be a huge hit! Join us to increase your followers and give your readers a chance to win the world’s most advanced 7″ tablet! You must have a family-friendly blog! You must have over 300 Facebook followers! You must complete ALL the sign up steps below! Participating bloggers are allowed to enter the giveaway, so don’t let that stop you from signing up! The giveaway will be open to USA only, but Canadian bloggers are welcome to sign up for the event. 1. Help us promote this event by (choose one — required): Write a blog post about sign ups for this event, linking it to this post, and mention it via your Facebook fan page and/or Twitter. OR, add the event button (above) to your blog sidebar and link it to Daily Mothering. Must be clearly visible from the time of sign up until the event is over. 2. Complete the sign up form HERE. 3. Join the Facebook group for the event HERE. 4. Post the giveaway HTML and Rafflecopter code (both will be provided via Facebook and email closer to the event date) on the appropriate day/time on your blog, and help us promote the giveaway via Facebook, Twitter, and other social mediums for maximum exposure! Event sign ups close October 1st, 2012 at 11:59 EST.